Youth leaders from Afghanistan, Bhutan, Bangladesh, Canada, India, Japan, Liberia, Malaysia, Mongolia, Nepal, Palestine, Philippines, South Africa, South Sudan, Thailand, Sri Lanka and Zimbabwe joined in these deliberations. Chandigarh : National and international delegates of the 12th Global Youth Peace Festival, students of Chitkara University and Government Girls Model Senior Secondary School in Sector 18C joined the Wildlife Conservation Walk to mark the wildlife week celebrations on Monday. UT Administrator V P Singh Badnore flagged off the walk at Sukhna Lake. Later in the day, at the valedictory function of the Global Youth Peace Festival, a new global body of global youth peace forum was announced at the Chandigarh Institute of Hotel Management in Sector 42, where it was decided to take the mission of youth leadership and transformative change forward. Youth leaders from Afghanistan, Bhutan, Bangladesh, Canada, India, Japan, Liberia, Malaysia, Mongolia, Nepal, Palestine, Philippines, South Africa, South Sudan, Thailand, Sri Lanka and Zimbabwe joined in these deliberations. They all resolved to increase their strength by ensuring participation of minimum 50 country youth at the 13th Global Youth Peace Fest. Madan Mohan Goyal, director, Rajiv Gandhi National Institute of Youth Development, Tamil Nadu, and social activist Jayashree Sharma felicitated all the international delegates with Mahatma Gandhi’s portraits. The Chandigarh tourism department gave city souvenirs to all the participating delegates. The event ended with a performance of Malwai Giddha with folk artistes and international delegates raising steps with beats of dhols. 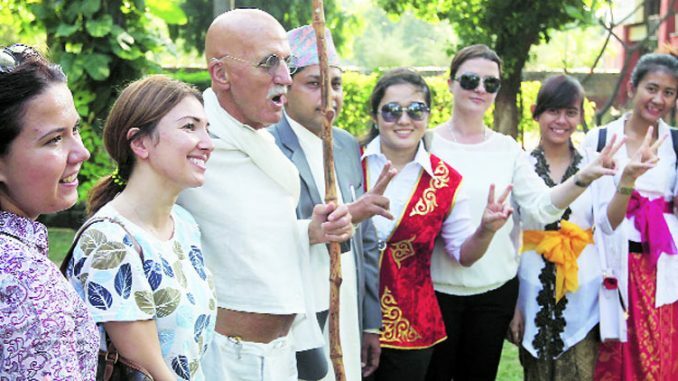 ‘The peace festival which began in a small manner 12 years ago with 14 youth participants from Pakistan has now grown to include many young people from almost all continents making Chandigarh a global venue for peace dialogue every October. With the support of everyone gathered here, this initiative, we hope, will inspire more youth leadership and transformative change.” said Pramod Sharma, coordinator, Yuvsatta, the main organiser of Global Youth Peace Fest.